Members of the international community are at the United Nations Wednesday, committing serious financial assistance to Haiti for its long term reconstruction. Donors’ offered millions of dollars to all sectors in a bid to help Haiti “build back better” after its devastating January earthquake. Haiti’s reconstruction is estimated to need 10 years and $11.5 billion. But Wednesday’s conference aimed to meet reconstruction costs for just the first 18 months. The Haitian government is going to be in the lead on this, and Prime Minister Jean-Max Bellerive outlined his country’s blueprint for a national action plan to guide the reconstruction to the 140 members of the international community who participated in the pledging conference. He said funds are needed for every part of Haiti’s infrastructure, to create jobs, and to put the country on the path to sustainable development. “We need about $4 billion in the next 18 months to achieve the critical mass that is necessary to achieve the momentum to make the difference that we talked about together. We need to innovate. Favorable conditions are there and we must succeed,” said the Haitian prime minister. Countries lined up to help, with conference co-chair, the United States, leading the way. U.S. Secretary of State Hillary Clinton said if Haiti creates strong, transparent and accountable institutions it can become a engine for progress and prosperity. “To that end, the United States pledges $1.15 billion for Haiti’s long-term recovery and reconstruction, which will go toward supporting the government of Haiti’s plan to strengthen agriculture, energy, health, and security and governance,” she said. Also announcing their contributions early in the conference were the European Union, pledging over $1.6 billion, Brazil, offering $172 million, France giving $27 million, and Spain pledging $465 million. U.N. Secretary-General Ban Ki-moon, one of the co-chairs of the meeting, said reconstruction assistance must be well-invested and well-coordinated. He added that it must work in parallel with the continuing humanitarian assistance effort, and urged donors to further fund a U.N. appeal for $1.4 billion that is only half met. That money is to meet emergency needs – such as water, food, shelter and sanitation – for this year. 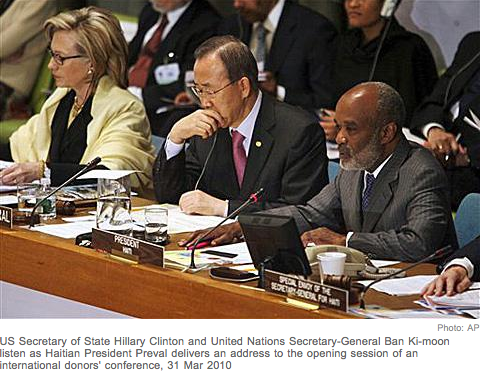 By the end of the day, the U.N. expects pledges of nearly $4 billion to be committed to Haiti. It is good to hear of commitment towards Haiti’s recovery. I just watched a Mark Danner narrated piece on CSPAN last night. It focused on the January 12 quake and the recovery efforts. I was disturbed to watch two key figures in the MINUSTAH leadership trying to explain away the 7 inactive days after the disaster. Their comments would lead you to believe that were didn’t act as part of a planned concept …. Rather than act instantly, as one would expect…they say back to see how things developed. Sort of like a Fire Department watching a small fire…to see how it developed only to face a five alarm conflagration. In reality, MINUSTAH was, is and will always be one step behind any situation requiring quick, thoughtful action. The lady spokesperson was really an egocentric jerk and should be sent somewhere else. She has no feeling for, or understanding of the Haitian people or their needs. She is just another fat bureaucrat sponging off the world community’s checkbook. I don’t want to appear a chauvinist, but why are all the ladies with the UN ugly?? The CSPAN piece was careful to state that it wasn’t – in any way – impugning the integrity of Preval….but, there was a lot of corruption around. You cannot cure a disease without an accurate diagnosis. Preval’s integrity (he has none..he has zero) must be brought into question. He is provably a major thief of public funds, coordinator of gang activity…mastermind of the kidnap network and torturer of women. He is probably guilty of traffic violations, but these could be overlooked. In other words…PREVAL IS THE NATION’S LEADING CRIMINAL AND HE HAS ABSOLUTELY NO INTEGRITY. Unless we start from this point, we will never arrive at a constructive destination and Haiti will be doomed. Someone must coordinate an oversight accounting for funds flowing into Haiti so that we can be sure they are spent properly and Haiti doesn’t suffer the crimes of Preval, or anyone else. Let’s aim for elections so that Haiti has a legitimate government. No more of these airey-fairy transitional, provisional, governing council…council of State or whatever excuse people think up. Haiti needs a real election – properly supervised and then steps can be taken to save the Nation. Bien dit! il n’y a pas d’autre? We need voice on this website? If anyone can bring “proof”, this is the time! Please post your comments in support of President Preval, or point-out “why” he should not be supported. Slurs, anger, frustration are understood but do not have “water in the bucket”. Negativity must be substantiated please! Whereas There’s no doubt that your post is on the appropriate track there are actually several points i tend not to agree with. Just checking out your page on my brand new Nokia Phone , and I wanted to see if it would allow me reply or if it made me go to a pc to do that. Ill check back later to see if it worked.